Taking on the Erie Otters at home, there were plenty of new faces playing their first game in Oshawa for the Generals. The Gens came out of the gate hard in the first period with plenty of scoring opportunities, upon which they were quick to capitalize when Danyk Drouin jammed the puck past former General Cole Ceci only 2:43 into the game. Less than two minutes later and after Gens goaltender Kyle Keyser made some highlight reel saves, Tyler Tullio was able to bury a goal on the rebound, giving the Gens a quick 2-0 lead. However, the Otters were not going to take it lying down, as Danial Singer scored with only four minutes left in the period to cut the Gens lead in half. In the third period the defense broke down for both teams as a total of five goals were scored. It started quickly as Singer scored again for Erie to tie the game 2-2, and after some back and forth between the teams, just past the halfway point of the period Brendan Hoffman gave the Otters the lead. However, in the dying minutes of the period the Gens refused to say die as the newly acquired Brandon Saigeon sniped one in off the bar, scoring his third goal in three games since joining the Gens, to tie the game. Nando Eggenberger then scored the game-winning goal when he got his stick on a loose puck in front of the net to give the Gens a 4-3 lead at the end of the period. Despite some back and forth play in the third, the Gens were able to maintain the lead and the victory over the Otters. Saigeon was named the first star of the game after he scored the game-tying goal, and Eggenberger was named the second star after scoring the game-winner. The Gens out shot their opponents 39-29, and went two-for-four on the power play. In earlier action, the Gens were on the road taking on the rival Peterborough Petes. The Gens hit the ice hard as it took them less than a minute to open the scoring. Anthony Salinitri tapped one in after taking a pass from Allan McShane right in front of the net. However, despite some solid chances, it was a whole 10 minutes later when another goal was scored, this time by the Petes’ Nick Robertson. Less than 30 seconds after, however, McShane tapped one in from in front of the net after a one-timer from the blue line by Giovanni Vallati. However, the Petes weren’t done yet as Max Grondin put one past Keyser in the dying seconds of the first to tie the game. Heading into the second, the Gens were looking to retake the lead, however the Petes weren’t simply going to let them take it as Ryan Merkley scored to tie things up again. However, Saigeon scored his first goal as a Gen less than a minute later when he sniped one past goalie Hunter Jones to tie the game. With less than a minute left in the second, McShane put one past Jones to give the Gens a 4-3 lead at the end of the period. Once again heading into the third the Gens moved quickly, as William Ennis netted a one-timer to add to the Oshawa lead. However, things wouldn’t go so well for the Gens from then on in the third, as Erik Cermak and Adam Timleck both scored for the Petes to tie the game 5-5 at the end of the third, forcing overtime. Just over a minute into the extra frame, Serron Noel broke away from the pack to wrist the game winning goal past Jones, giving the Gens a 6-5 victory over their hated rival. McShane was named the first star of the game after scoring two goals and two assists, and newly acquired Nicolas Mattinen was named the third star of the game after getting two assists in his first game as a General. Oshawa out shot their opponent 36-27, but went scoreless in four power play opportunities. Still on the road, the Gens then took on the Barrie Colts in the hopes their good fortune would continue after the overtime victory. The game started off slow, as it took 15 minutes for either team to break the scoreless tie, as Ben Hawerchuk, son of Hall of Famer Dale, broke the tie for the Colts. The Gens didn’t take that lying down however, as Saigeon rocketed one past Colts netminder Jet Greaves to tie the game 1-1 at the end of the first. After a scoreless second, those in attendance were itching for the tie to break, and they got their wish, though not in the form they were hoping for, as new General Brett Neumann, playing in his third game since being acquired, scored after playing some tic-tac-toe in front of Greaves. After giving up the lead, the Colts removed Greaves from net in the dying seconds of the game to gain the extra attacker, but it was not enough however as Neumann once again took the puck and scored his second of the game, also his 28th of the season. In the end, the Gens beat the Colts 3-1. 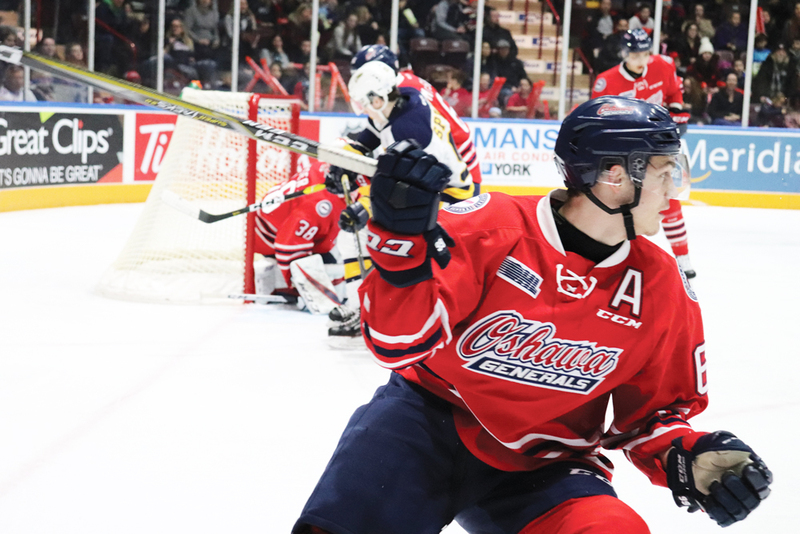 The Gens traded plenty of chances with their opponent, but ultimately out shot them 37-31. After sweeping the weekend, the Gens now move on to play the Kingston Frontenacs on the road on Friday, Jan. 18, followed by their next home game on Sunday, Jan. 20 at 6:05 p.m. against the Flint Firebirds.